In 2005, twelve cartoons mocking the prophet Mohammed appeared in the Danish newspaper Jyllands-Posten, igniting a political firestorm over demands by some Muslims that the claims of their religious faith take precedence over freedom of expression. Given the explosive reaction from Middle Eastern governments, Muslim clerics, and some Danish politicians, the stage was set for a backlash against Muslims in Denmark. But no such backlash occurred. 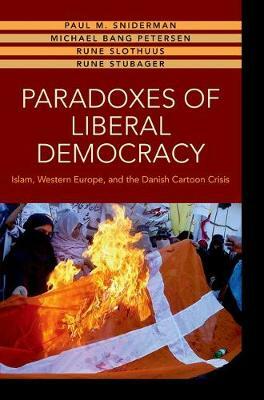 Paradoxes of Liberal Democracy shows how the majority of ordinary Danish citizens provided a solid wall of support for the rights of their country's growing Muslim minority, drawing a sharp distinction between Muslim immigrants and Islamic fundamentalists and supporting the civil rights of Muslim immigrants as fully as those of fellow Danes--for example, Christian fundamentalists. Building on randomized experiments conducted as part of large, nationally representative opinion surveys, Paradoxes of Liberal Democracy also demonstrates how the moral covenant underpinning the welfare state simultaneously promotes equal treatment for some Muslim immigrants and opens the door to discrimination against others. Revealing the strength of Denmark's commitment to democratic values, Paradoxes of Liberal Democracy underlines the challenges of inclusion but offers hope to those seeking to reconcile the secular values of liberal democracy and the religious faith of Muslim immigrants in Europe.